And while the first two are definite, I knew in my gut it was the last that was the absolute truth. 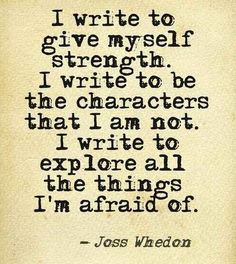 I write, and keep returning to writing no matter how tired or busy I am--because in the end the story is worth it. (And I can't help it anyway, it's in my blood). Sometimes it's like being possessed--so possessed by an idea that you can't help but bring it to life, to make sure that it has a shot at being known. The fact that I'm the one writing it is almost circumstantial. Coincidence. A story needs a vessel to get it to the world, but in the end it's the story that wins the battle. And knowing in your gut that you have a worthwhile story--you have an awesome idea that's growing inside your head---that is awesome. It will get you through the long haul. Although I do hope that it'll enable me to earn a living. Working retail takes so much time and energy. Does make brain work a bit harder...coffee only goes so far.